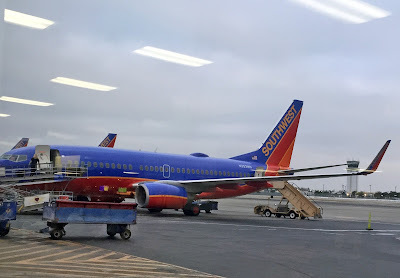 The Burbank Airport, which is in the San Fernando Valley of Los Angeles, is wonderfully weird. If you're like me, and like to time-travel, it's a pleasure. Yeah, you still have to do all of that annoying airport stuff, like going through security, standing in lines, taking off your shoes, paying too much for a candy bar. And yeah, you gotta show up hours ahead of time, and there's a lot of waiting. Luckily, Burbank Airport has big windows on ground level and you're just a few feet from the planes. 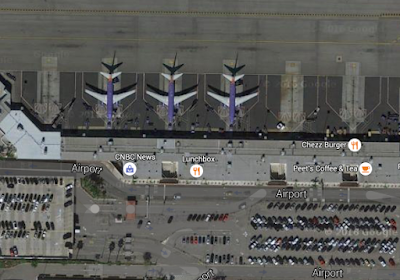 Nowadays, of course, most airports are much bigger, and much safer, than Burbank. When it was built, in the 1930s, airports weren't the insulated things we now know. The planes were more like buses that pulled up, and you walked onto them. And the modern legal distance that planes can approach the terminal is much more than at Burbank, which has a special exemption. And that means that the planes are right there. Come to Burbank Airport with me. Don't worry about how crowded it is, no one will get in our way. The vast majority of people will be huddled up in the chairs, looking at their cell phones, or watching TV. The younger, and more athletic, people will be lounging on the floor. To them, an airport, any airport, is a place of misery. A place of staring at screens, worrying about flight times, concern about whether they'll get peanuts on the plane. I have no interest in that conversation. Come with me, we're going over to look out the window at the planes. The Burbank Airport is tiny. I mean ridiculously tiny. After security, you walk to gate A3, which is next to Peet's Coffee Shop. I would say that it's no more than 150 yards, if that. And oh yeah, there's only one floor. And the planes pull right up to the terminal, you walk out the door (as if it was a movie from the 1940s), walk onto the tarmac, and up a ramp into the plane. But there's a more fun way that I discovered yesterday. Walk with me. Take a look at the plane at the top of this post and you'll notice that there's a door in the back of a 737. Of course, in most airports you don't even look at the plane, you walk through a tunnel and enter through the front. At Burbank, you can walk in through the back. Yes, they bring an old style stairwell up to it, you walk under the wing (how cool is that?!) and then up the steps. And since very few people even know about this, the line that's moving sluggishly up the ramp has people standing in line long after you've sat down. We're sitting towards the back of the plane, of course in a window seat, looking out at the flurry of activity of the airport. Walking out onto the tarmac of an airport is something that in my young life I've rarely done. You get a real sense of how big and powerful airplanes are, how amazing flying through the air in the big chunk of steel is. Of course, it's safer to enter the plane through one of those tunnel thingees, but to me it's like living in an elevator. Too boring for me! I've always enjoyed airports. When I was a kid I would ride my bike over to the Minneapolis Airport, just to look at the planes and the buildings. I guess they don't allow that anymore! To me, an airport was like being a space station. Then airports became enclosed places, like being inside of an elevator. No wonder people hate airports! They are safe, though! If you're lucky enough to fly into Burbank, enjoy! Walk out onto the tarmac! Thank you to my patrons on Patreon who help support History Adventuring! If you like these blog posts, and would like to make suggestions for future ones, please go to patreon.com/PhoenixHistoryAdventuring where you can show your support for as little as $1 a month. Thank you!